Laleur Skin Cream Review : Ingredients, Side Effects, Detailed Review And More. What Is Laleur Skin Cream? Rehydrate your chronically dry skin. Soothe and calm skin inflammation and irritations to even out your skin tone and stop your skin from sustaining permanent damages. Fade dark circles and age spots, while also smoothening out fine lines and wrinkles. Improve the appearance of tired, fatigued skin by restoring elasticity, volume and contour. Information about this product’s manufacturer and its experience in formulating anti-aging skin care lines is not available. What Are The Ingredients In Laleur Skin Cream? Shea Butter: Brings about a comfortable moisturizing feel on the surface of your skin as it simultaneously nourishes your skin deeply to boost hydration as it soothes your skin with its rich fatty acid and Vitamin E contents. Vitamin Complex: Support your skin in bouncing back to life. Antioxidants: Protect your skin from further damage so that repair works can cope with existing damage. Moisturizers: Condition skin and help keep it hydrated and protected from dryness over long periods of time. 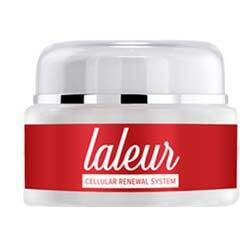 Laleur Skin Cream must be eased into your morning and evening anti-aging skin care, following cleansing and toning. This product is available via a 14-day free trial offer where you are obliged to pay only for shipment and handling fees initially, although 14 days is severely limited by a period for you to assess of how this product reacts with your aging skin. This product has been claimed to deliver multiple functionalities that specifically targeted aging skin concerns. Laleur Skin Cream reviews have attested to this product’s safety and potency of formulation, although most of these statements are posted on websites that appear to have a vested interested in moving product sales. Available information about this product’s formula is severely limited, and where it is available, the information is highly unreliable and details are not provided, assessing product potency and efficacy rather problematic. There is no information available about this product’s manufacturers which make it impossible to establish accountability for possible side effects as well as the security of online transactions. Laleur Skin Cream reviews are limited, the positive feedback appearing biased. The negative reviews generally point to multiple difficulties experienced by users concerning transactions, payments and delivery. It’s not easy to believe in what Laleur Skin Cream claims it brings to your aging skin. The good sleuth that you are, however, knows there must be more than meets the eye. If you like what you see, this product may well suit your anti-aging regimen and, if you find it doesn’t, there will always be another product for you to see.